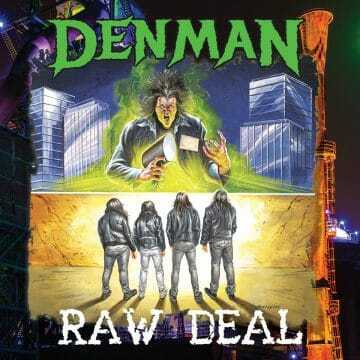 FOR THOSE NOT FAMILIAR WITH DENMAN, THEY ARE ONE OF THE MOST EXCITING NEW BANDS AND ARE ABOUT TO RELEASE THEIR DEBUT FULL-LENGTH ALBUM ‘RAW DEAL’ ON FEBRUARY 7, 2019. THE GROUP RELEASED ITS DEBUT EP ‘THE LIFE WE LIVE’ BACK IN EARLY 2017 AND HAVE BEEN FORGING A REPUTATION AS A GREAT LIVE ACT AS SLEAZE ROXX SAW FIRST HAND LAST YEAR IN EARLY MAY AT THE SLEAZY SLIMEY SUNDAY 3 IN HANOVER, MARYLAND, USA. IF THERE’S ONE THING THAT I TOOK AWAY FROM MY INTERVIEW WITH DENMAN GUITARIST DAKOTA DENMAN, IT’S THAT THE MAN ABSOLUTELY LOVES PLAYING GUITAR! Sleaze Roxx: You have a new album coming out in February. Can you please give us the details of the album? How many songs and all that good stuff? Dakota Denman: Alright. So yeah. February 7th is the date. The album is called ‘Raw Deal.’ It was produced, mixed and mastered by Michael Wagener. It has 11 songs on it. The official download has ten [tracks] and just have an extra track on the CD. So if you get the hard copy version, you get a little treat [laughs]. Sleaze Roxx: That’s cool [laughs]. Dakota Denman: Yeah, we had a lot of fun doing it. We got the final mixes. They were finally finished up in like March – April, and the summer. We have our CD release party last at the Basement East, which is a pretty sweet club here in Nashville [Tennessee, USA] and then we’re booking stuff for the summer right now. So yeah, it’s coming! I’m super excited! 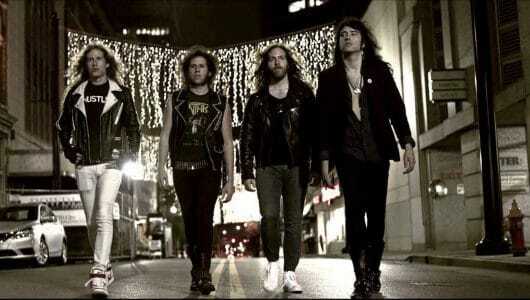 Sleaze Roxx: How did you come up with the album title ‘Raw Deal’? Dakota Denman: Well, it’s kind of a funny story. We finished recording and were in the mixing process. We went out to lunch and were like, ‘What are we going to call it?’ We were like, ‘Oh man. That’s a good question.’ We didn’t want to call the album after a song title because we did that already for the last one. Let’s think of something else. We had a cool concept idea for the album cover, which was the four of us on the front with our backs turned and this crazy looking demonic judge guy sentencing us on the cover. We had it painted and it looked totally awesome. We just came up with the concept and a lot of young rock bands nowadays, they’re pretty much getting the raw deal. They’re not getting treated super well. The music industry makes it really tough and that’s how the concept of the album title come about. 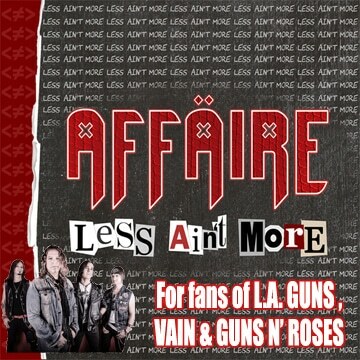 Sleaze Roxx: I’m going to get back to that but it looks like you came up with the album cover before the album title. Is that right? Dakota Denman: Yeah. I think that’s how it went down. We had lots of different ideas and that was one of them. And then when we came up with the title, it all just came together. 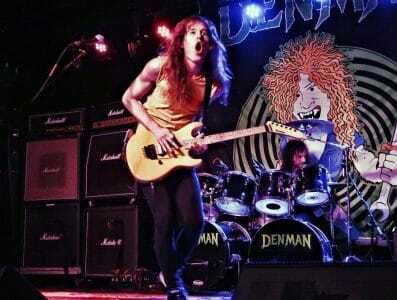 Sleaze Roxx: Speaking of getting the raw deal, how has Denman experienced getting a raw deal within the music industry? Dakota Denman: It’s a lot of little things. You get to the club and a lot of promoters expect the trailing bands to provide the back lines. A lot of little stuff. There’s always something With every band, there’s always something. I’m not going to go in too much details but it’s always a struggle. Sleaze Roxx: I understand that at one point, you were looking for a record label for the new album but you decided to release it on your own. How did that come about? Dakota Denman: Well, we’ve been talking to a few different labels and you know, I’m not sure how much I should go into detail about who we were talking to and all that stuff but ultimately, they decided to pass and didn’t want to release it so we decided to independently release it like a lot of other metal bands do these days. It’s the power of the internet. You can get the word out that way and you don’t have a record company owning your album. And basically you don’t have much say on what happens to it. Basically, they own the music and all that good stuff. I like to own the master tapes and know that it’s ours. Sleaze Roxx: So ‘The Life We Live’ had a alot of variety on the EP and surprisingly considering that you only had five songs. What can we expect from ‘Raw Deal’? Dakota Denman: We obviously have a full-length album. We had more time and more to say. It’s pretty much along the same lines if you’re going to compare. 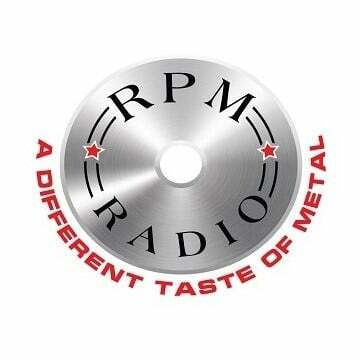 There is some more thrashy tunes. Because we had ten tracks instead of five, we were able to reach out a little bit more in that direction compared to the previous one which only had five songs. I’m happy with it and I hope that a lot of people that listen to it will also be. There’s some really good variety on it. 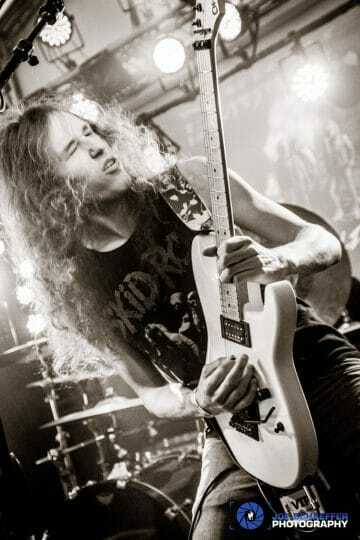 We’re not just playing just your typical ’80s hair metal songs. We’re making a variety of it. We have some thrashier songs coming your way so we’re excited to see what the reception is going to be there. 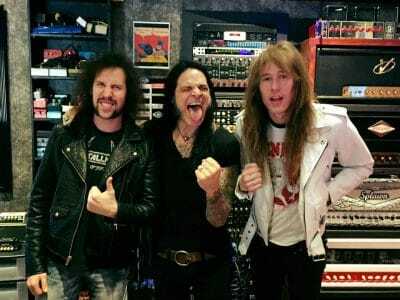 Sleaze Roxx: In terms of the new album, is it all new songs? I know that it’s very popular these days to release an EP and then you re-release them in a full-length with the same songs and you add a couple more. Dakota Denman: No. It will ten more new original songs that were not previously released on the EP. Sleaze Roxx: Last time, you had Mark Slaughter guest on one of the songs. Do you have any guest performers this time around? Dakota Denman: Yeah. Chuck Garric from Beastö Blancö — he’s a pretty good friend of ours. We wrote a song that kind of reminded me of what he would sing. It kind of had a Beastö Blancö vibe to it. It was like, ‘Man, it would be pretty cool to have Chuck come down and sing a verse.’ So that’s exactly what he did so Chuck is our guest on this record. We really have a good time when people like that come down. We usually just hang out, grab some lunch and spend the afternoon recording some stuff. That’s usually a really good time so maybe, we’ll keep doing that. So having someone do a guest verse, it’s always a lot of fun. Chuck is our guest on this record. Sleaze Roxx: Are you going to have any videos for the album and if so, which one is going to be the first one? Dakota Denman: Right now, we are in pre-production of shooting a video for a song called “Gun Slinger” which is not out yet. Our goal is to have a video right around the same time as the CD release. 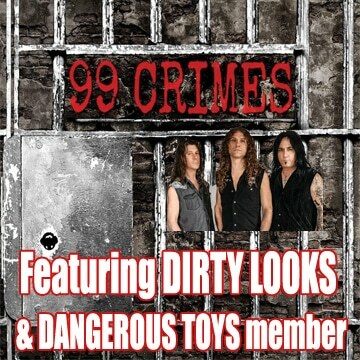 Sleaze Roxx: So the album release date is the same as the CD release party, right? 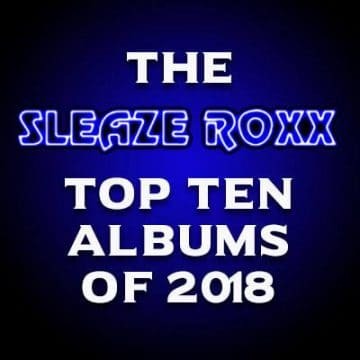 Sleaze Roxx: What are your favorite tracks on the new album? Dakota Denman: Favorite tracks? I really dig “Nightime Jungle.” That song is super cool. That’s a song about back home, which has a big prison there. It’s one of the thrashier ones that’s fun to play. That’s the opening track on our album. We’ve been opening the set with that one lately. The song’s got a lot of energy and it’s a fun one to play. It’s one of my favourite tracks too. 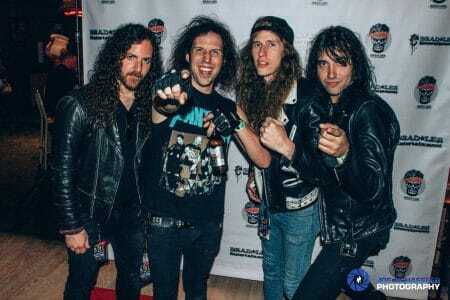 Sleaze Roxx: I understand that you and your brother [Ben] and one of your other bandmates [bassist Robert Crede] have a Metallica tribute band [Fade To Blackened] at the same time. Is that correct? Sleaze Roxx: How would you compare having your own band to have a tribute band? Dakota Denman: Well, it’s definitely a lot different. We spend a lot of time writing our own songs and recording and all that stuff. In a tribute band, you really don’t have to do any of that stuff. You just play someone else’s songs. People love Metallica. We’ve played a lot of shows here in Nashville where we play Metallica basically to a packed house and everybody was going crazy. We’re not going to let it be our main focus but I know lots of guys that are in multiple bands and do the tribute band thing. You know, we love to play. At the end of the day, we are musicians and we can only play so many shows with our own band right here in Nashville and the surrounding area so it’s fun to go out and play some cover tunes and have a good time playing music for people. Sleaze Roxx: What can we expect from you guys once the album is released? What gigs do you have coming up? Dakota Denman: So obviously as I mentioned, we have the CD release party here in Nashville [on February 7, 2019]. We’re playing Rocklanta with Warrant, FireHouse, Tyketto, Dangerous Toys… It’s a two-day festival in Atlanta, Georgia [USA]. We have some Nashville and Knoxville dates that we are looking forward to doing. Obviously, we are going to start putting some runs together. We are from upstate New York so we are probably going to play in Ohio, Indiana and all that good stuff and eventually make our way back there. There’s a bunch of clubs that we have played before like Rochester [New York] close to Syracuse [New York]. Stuff like that. Do little runs when we can and have a good time doing it. Sleaze Roxx: You’ve been doing a riff of the week segment on YouTube. How did you come up with that? Dakota Denman: Well, these days with the internet and stuff like that, it’s really important to keep putting out media and visuals and having people see you. Obviously, I love playing guitar and I pretty much know a lot of songs so I was like, ‘Man, I’m just going to start putting these out when I have time.’ Bought myself a decent camera. I just started covering stuff and had a lot of fun doing it. I kept picking songs and doing them myself and next thing you know, I’m doing Yngwie [Malmsteen], Extreme and George Lynch kind of stuff. I’m having fun. Like I said, we’re musicians. We like to play. Anytime I can pick up my guitar and record some stuff, and have people enjoy it, that makes me happy. So that’s how it came about. Just wanted to keep putting media out there and keep playing my guitar. Sleaze Roxx: Last question for you. What are your top three all-time favorite albums and why? Dakota Denman: Three favorite all-time albums and why? So as far as a top three is concerned, for thrash metal, I’d have to go with ‘Master Of Puppets’ from Metallica. I think that all around, it’s just a really good metal record. The songs are awesome and one of my good friends [producer Michael Wagener] mixed it so that’s kind of cool! The first Van Halen album changed the game for shred guitar. That and “Eruption” had a really big impact on me. And then, the fun stuff, the guitar stuff, I’d have to go with ‘Shout At The Devil’ from Mötley Crüe. Something like that. Whenever we hang out with a bunch of friends, we always end up playing it. Riff of the Week! George Lynch tooth and nail solo!